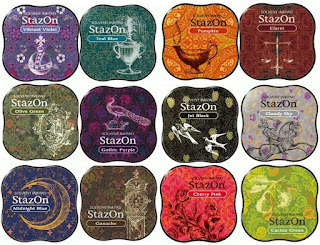 Two words...StazOn Midi. Holy cow! Can I just say I am IN LOVE?! First, let me be completely honest. I bought the inks because of the packaging. I said, "Self, those are pretty snappy labels on those inks and with ink names like Gothic Purple, St. Valentine and Blue Hawaii, how can they NOT come home with me?" I literally and figuratively OWN my judgmental side and man, did I ever SCORE! As snappy as the packaging is, I really am not all that ga-ga over StazOn ink. I find the colors to be too bubble gum bright and I really like the deeper color tones. I am happy to report that the Midi's are definitely that more regal color! 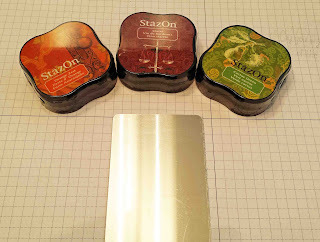 Like all of the other StazOn inks, the Midis' are a solvent ink pad, which means you can stamp on a ton of different surfaces, such as metal. =) THIS is where the fun begins! 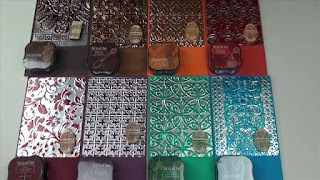 My true love for the Midi inks came initially from watching this video on the Imagine Crafts website. I had to try it and see if it was all that it was cracked up to be. 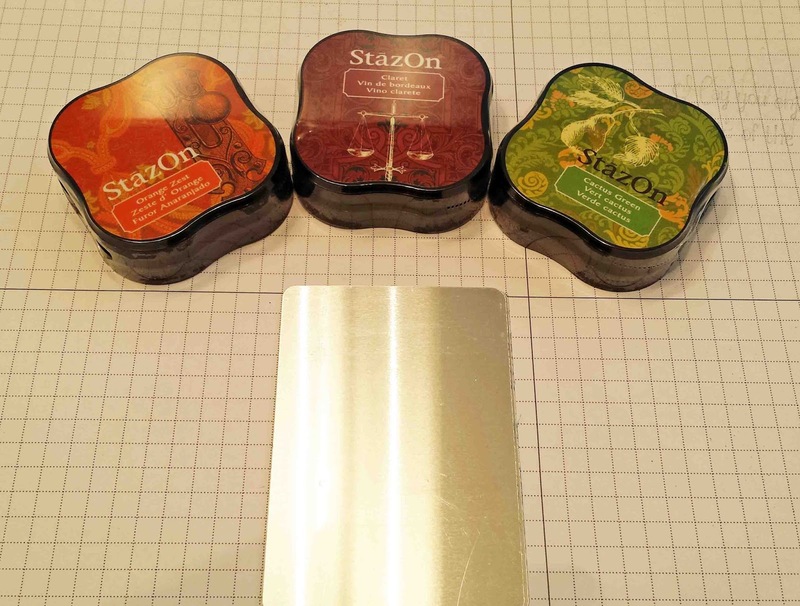 In order to stamp on the SHEET Metal, you need to have GlazOn and a dense sponge. I used the Ink Blushers from IC. 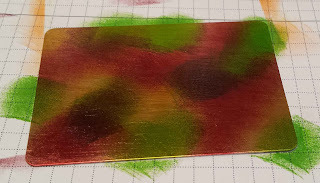 I was dying to use the Claret Midi ink so I figured a fall themed project would be PERFECT! So I snagged Cactus Green and Orange Zest as my companion colors. Imagine Crafts has these fabulous SHEET Metal ATC cards and it is the perfect size for a focal point on a card. I noticed that my DABBING the Orange Zest was extremely vibrant and if I swiped the sponge over the SHEET Metal, it was more subdued. I definitely liked the vibrancy so I just continued to dab it until it was completely covered. Now comes the the IMPORTANT part...let it dry and DON'T use your heat gun to speed up the process. Let's just say that um, ya, metal conducts heat....OUCH! 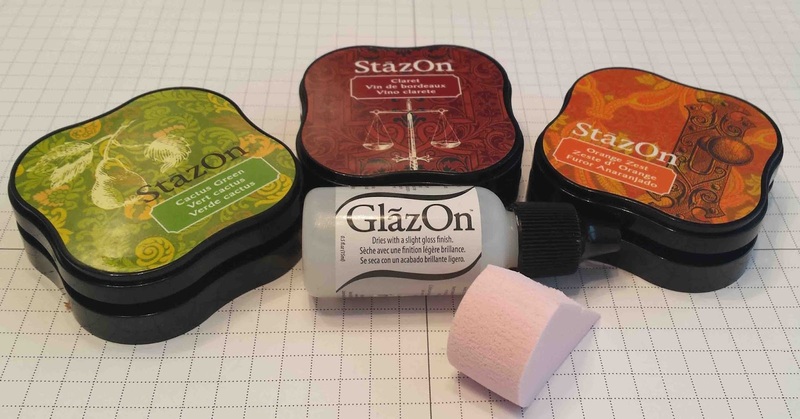 Once it is dry, it doesn't take very long, maybe 2 minutes, you are then going to use another separate Ink Blusher and squirt a nice blob of GlazOn onto the sponge. Let it dry - Depending on much you put on, it could take 3 to 5 minutes to dry. It's a great time to switch the laundry or empty the dishwasher. When I was finished with the Claret ink, I let it dry for a couple of minutes. Are you ready for the SUPER cool part? 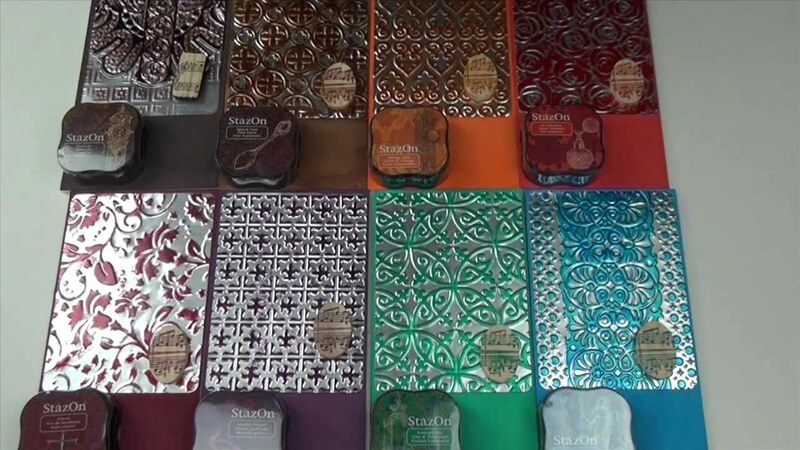 The SHEET Metal can be EMBOSSED! 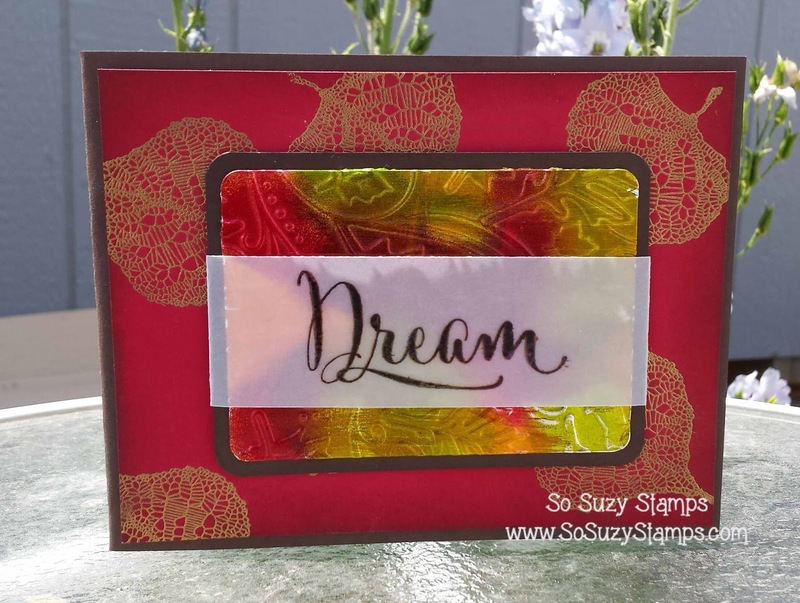 I totally ran my fall inspired SHEET Metal through my Big Shot using my Fall Leaves embossing folder and look how STUNNING it turned out! 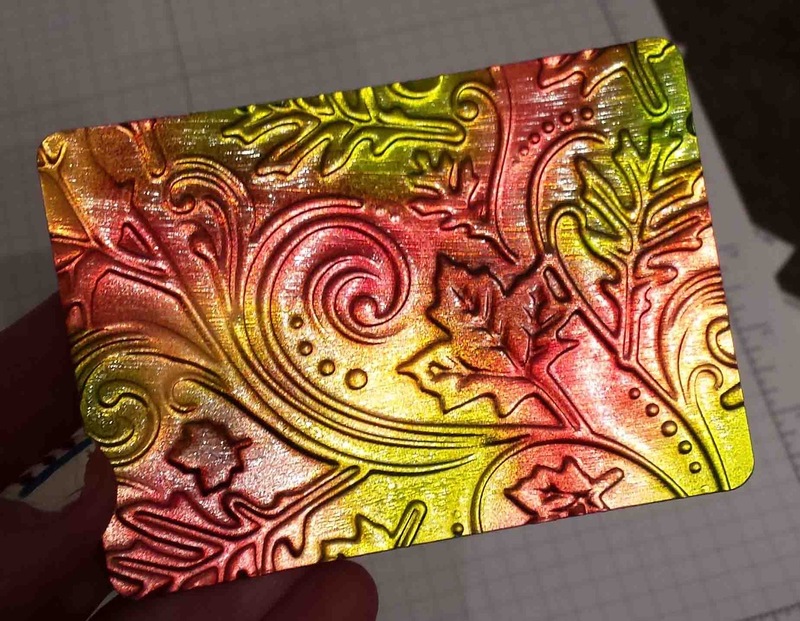 My fun little experiment was ready to put onto a card! 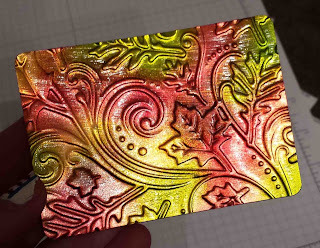 I now have a pretty card that I am not sure I want to part with anytime soon! At the moment, you can pick up all of the supplies needed to create this card in our physical shop. We will be offering it on the website AFTER the Retreat. In case you haven't heard, the website will be DOWN starting Friday, July 24th and will be back up and running on Friday, July 31st. We have our annual Card Retreat and I do not want to inconvenience anyone with out of stock or back ordered items. Thank you so much for your patience and as for Jen and I, we will be having all sorts of fun shenanigans at this year's Christmas in July Card Retreat! Absolutely beautiful card! Can't wait until you get those inks on the website! ZOMG...I cannot wait to see that beauty in person!! It looks stunning my dear! Love the names of these little inks too! Your card rocks!! I'm surprised!!!!!!! An awesome job, Suzanne. Oh, THANK YOU for saying it!! I promised myself I would never tell a single soul that the only reason I first bought the Midnight Blue was, well, I love BLUE, but it was the gold moon on the blue background that grabbed me (I am a celestial freak, from my telescopes & planetary map books to the sun & moon decor around my home, if it is a celestial heavenly body, you'll find it in some form in my house or studio). Of course, I also love peacocks and that is what made me buy the Gothic Purple (it looks like a peacock to me) and I am a lover of steampunk, which is why I also purchased the Ganache, Vibrant Violet and Olive Green (the graphics looked steampunky to me). I figured if I was going that far, I'd go ahead and buy the Teal Blue to honor the peacock, Cloudy Sky, Cactus Green and Cherry Pink. The only ones I did not buy was the Jet, Pumpkin & Claret because they didn't have those in stock yet. Another thing I like about the midi ink pads is the way they are shaped make them easier to hold, especially for those who are starting to have hand problems and refuse to admit it. 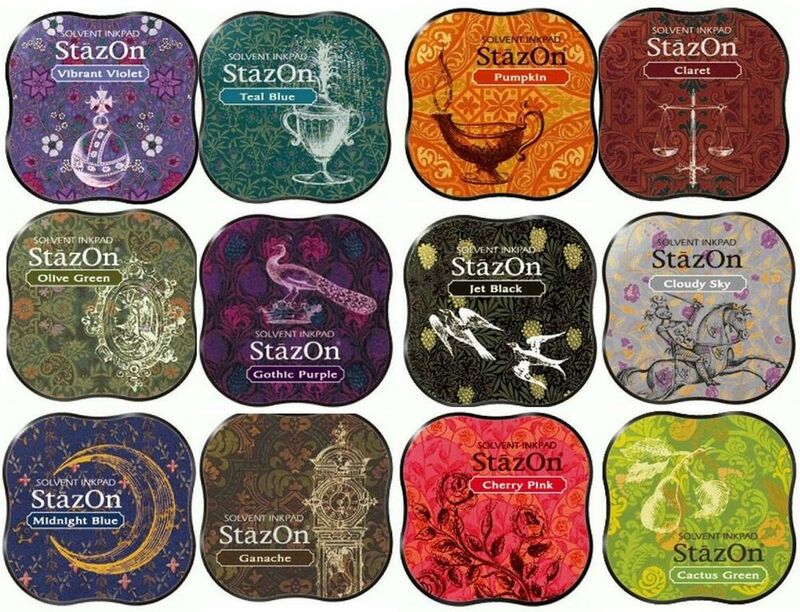 So, thank you again for allowing me to come out of the Staz-On Midi Ink Pads closet to tell the world, "Yes, I spotted them due to their graphics and colors. No, I didn't need them. But they were so CUTE sitting in that display! Cute names! Cute graphics! Cute colors! AND all solvent based!! What can anyone expect a crafter to do?! Besides, I have a coupon."